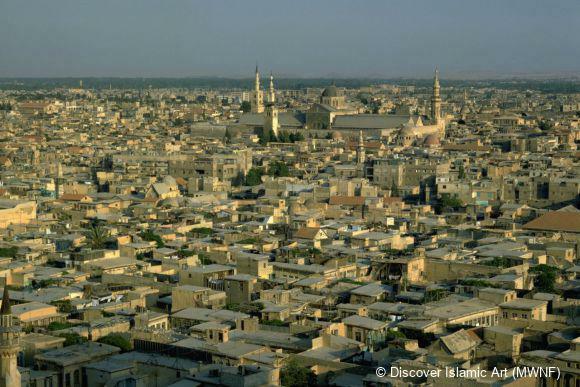 The inhabitants of Homs, led by Sulayman ibn 'Ubaid, oversaw the construction of the Greater Palace’s “city” area in the year AH 110 / AD 728–9, as evidenced by an inscription originally located in the palace mosque and currently found in the Museum of Aleppo. The interruption in the masonry indicates that this mosque was constructed just after the palace was completed. Hisham ibn Abd al-Malik (r. 105–25 / AD 723–42). 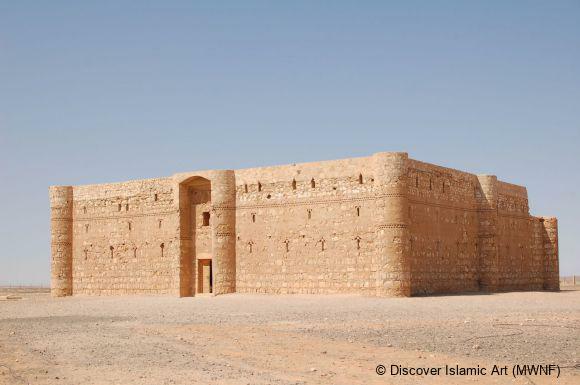 Qasr al-Hayr al-Sharqi is a huge complex, measuring 7 km x 4 km and surrounded by a thick wall some 17 km long. It includes two palace enclosures – one large, one small – an immense hammam, a khan, gardens and a water canal. The hammam, located to the north of the two palaces, consists of three parts: the frigidarium, tepidarium and calidarium. Fine marble was used to coat its interior walls and floors. The garden, located to the south of the palaces, id enclosed by a stone wall, towers and two gates. A water canal, which is paved with stone, extends 30 km in length, originating from the village of al-Kum, northwest of the site. 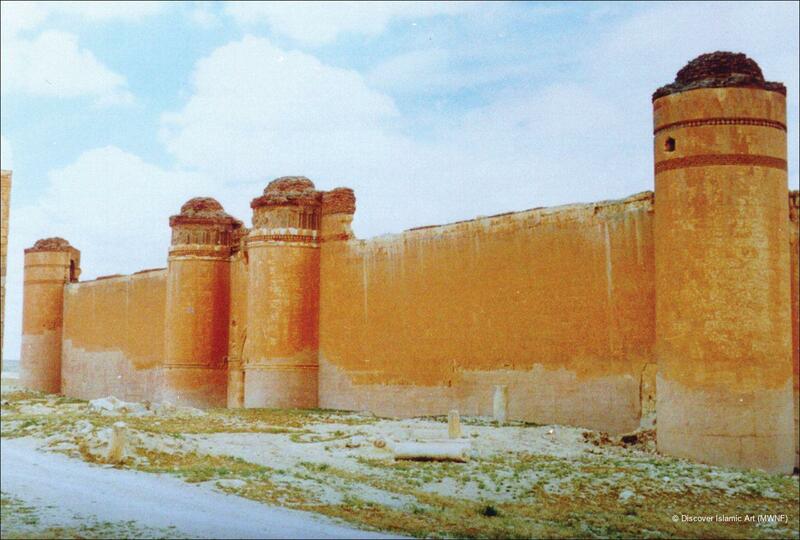 The smaller palace enclosure is nearly square, its sides measure approximately 70 m long, 2 m thick and around 14 m high. Four circular towers are situated at each corner and two semi-circular towers on each side. The towers are more closely spaced on the west wall, where they frame the only gate to the palace which is nearly 3 m wide, capped by a blind arch and decorated by a frieze that runs along the gate's flanking towers. Overlooking the entry gate from the rooftop is a machicolation propped up by three brackets. The entrance leads into a roofed corridor and an open courtyard, measuring 36 m x 28m, surrounded by an arcade and including a water cistern. There are two storeys that are identical in layout and constructed of hewn limestone blocks alternating with courses of fired brick and decorated with stucco. No evidence of decoration survives; ornamental features seem to have been focused on the gate. The larger palace enclosure is situated 42 m west of the smaller one, its eastern gate facing the latter's western gate. It is an immense square, measuring 160 m each side, with wall thickness and height similar to those of the smaller palace. It is carefully symmetrical, with four circular towers at the corners and six semi-circular towers along each side. The middle pairs flank four centrally oriented entry gates. All the towers have guard rooms at the top and arrow loops. 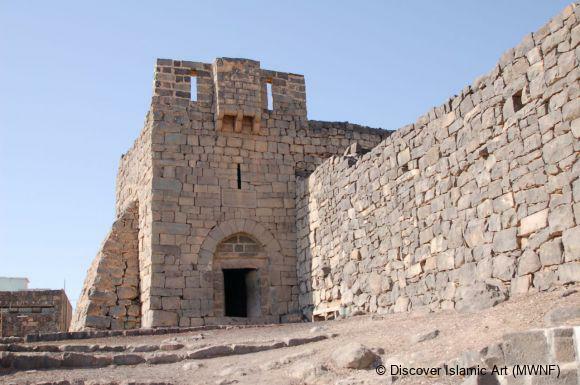 Unlike the smaller palace, the use of stone continues to the top of the towers and the name of the Caliph Hisham has been found inscribed on two of them. The gates are nearly identical and resemble that of the smaller palace, except the northern gate where the machicolation is wider, resting on five brackets, the central one decorated by a sunflower. The central courtyard is surrounded by an arcade with a large rectangular and roofed water cistern in the middle. An area within the palace is known as “the city” and includes six large dwellings, several smaller dwellings, an olive press, and a mosque that greatly resembles the Umayyad Mosque of Damascus. The mosque's minaret is square-based and stands separately, located between the two palaces and possibly once towering above them. 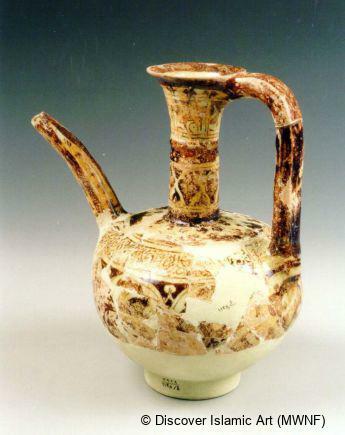 Raqqa pottery found on this site, dating to the AH 6th–7th / AD 12th–13th centuries, indicates the continuous occupation of the area. 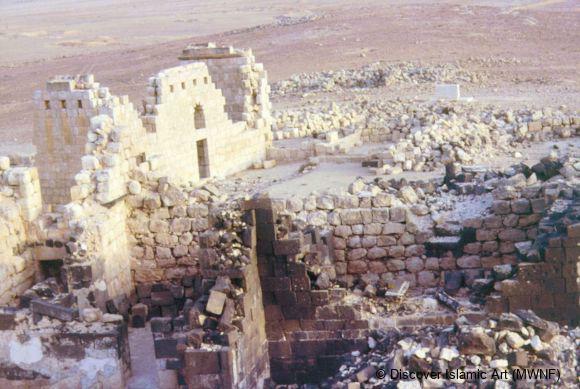 Its destruction took place at the hands of the Ottoman Sultan Murad IV in AH 1048 / AD 1638 fearing it was a haven for rebels. 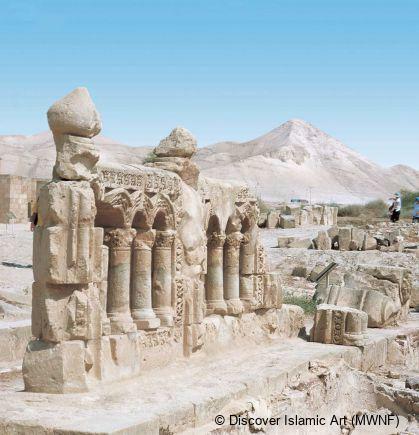 This large palatial complex located in the middle of the Syrian desert was built by the Umayyad Caliph Hisham ibn Abd al-Malik, who ruled between AH 105 and 125 / AD 723–42. 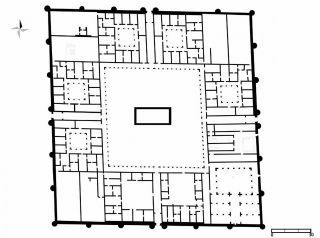 In addition to the courtly palaces, gardens and hammams, there existed a corner in the palace enclosure which seemed to have been an urban area featuring smaller housing and even a communal mosque designed in the shape of the Great Umayyad Mosque of Damascus. The dimensions of the entire site, including the smaller and larger palaces, are approximately 7 km x 4 km, all of which was cleverly supplied with water. There are no inscriptions to date the small palace. Some historians have suggested that it may be the site of Qasr Zaytuna, a palace mentioned in Islamic historical sources as the place where Hisham ibn Abd al-Malik resided before his assumption to the caliphate (that is prior to 105 / 703). With regard to the so-called “city”, there is an inscription in the mosque which mentions the date of construction as 110 (728–9). Bahnisi, A., "Al-Qusur al-Shamiyya wa Zakharifuha fi 'Ahd al-Umayyin [The Palaces of Syria and their Ornamentation in the Umayyad Era]”, al-Hawliyyat al-Athariyya al-Suriyya [The Syrian Archaeological Annals], Vol. 25, nos. 1 and 2, 1975, p.46–9. 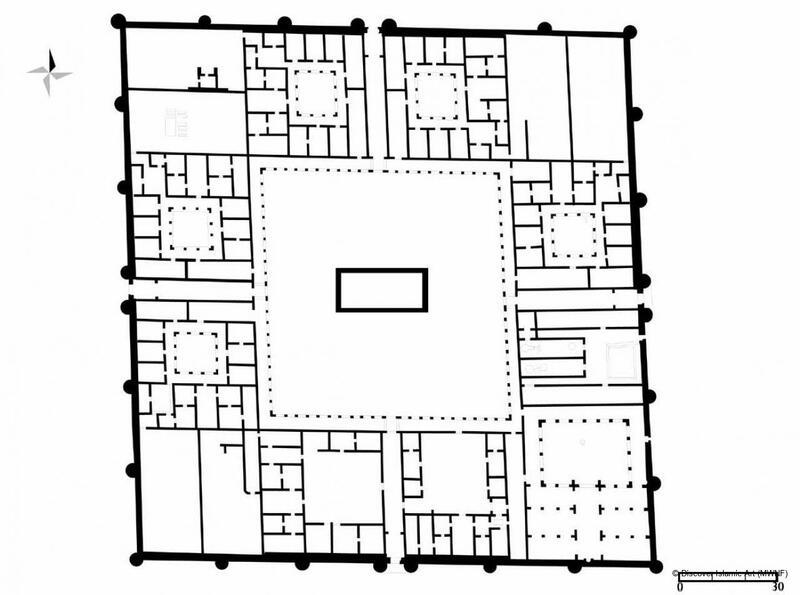 Creswell, K. A. C., A Short Account of Early Muslim Architecture, Lebanon, 1958, pp.111–23. 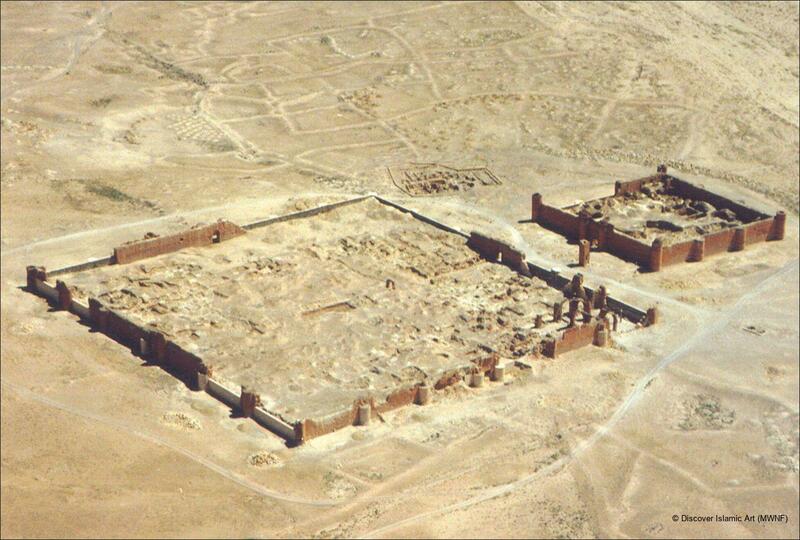 Grabar, O., et al, City in the Desert: Qasr al-Hayr East, Cambridge, 1978. Dina Bakkour is an archaeologist. She studied archaeology at the Institute of Archaeology and Museums in Damascus and General History at the University of Damascus. She received her Master's (DEA) in Islamic archaeology from the ParisI Sorbonne University, where she is currently preparing her Ph.D. thesis. She holds a Master's in Museology from the Ecole Du Louvre in Paris. Dina followed many stages in conservation and restoration in Rome, Murcia and Amsterdam. Nowadays, she works in the Directorate General of Antiquities and Museums in Damascus. She participated in many national and European excavations and restoration in Syria and taught at the Institute of Archaeology and Museum in Damascus. She was a contributor to The Restorations of Deir Mar Musa al-Habashi. 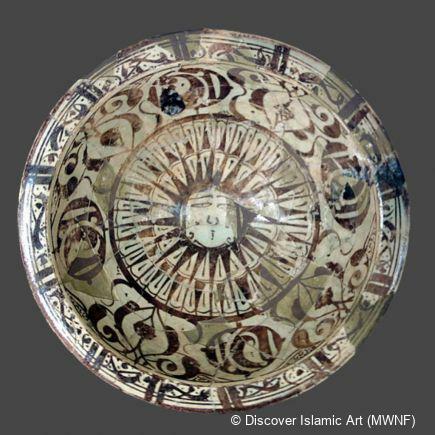 Nabek-Syria (Damascus: Syrian Ministry of Culture; Rome: Central Institute for Restoration).